Sign up for free and just shop with Graze as normal. Our average member earns over £300 cashback a year. Cashback is calculated excluding VAT. Graze cashback can be earned simply by clicking through to the merchant and shopping as normal. Graze Cashback is available through TopCashback on genuine, tracked transactions completed immediately and wholly online. Cashback is not payable where customers join up from a friend referral. 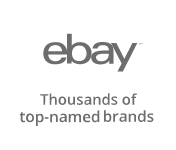 Cashback cannot be redeemed in conjunction with any other offer, other than that associated with TopCashback. Users who click through from TopCashback and enter a promotional code associated with a different graze promotion will not be entitled to cashback. If you earn cashback through this merchant, payouts cannot be made by British Airways Executive Club, Love2Shop, M&S e-Gift Card, PayPal. Enjoy snacking on exciting and nutritious treats for less by earning cashback when you order your first box thanks to our Graze promo code deals. Once you subscribe, you will be able to take your pick from more than 100 snacks, including vegan treats, created by their experts and approved by their nutritionist, with healthy and delicious new recipes being added all the time. Just tell them what you like and they will hand-pick a Graze box just for you. Whatever you choose, you will be happy to hear that your goodies will not contain any artificial colours, flavours or preservatives, while every snack in their portion-controlled punnets has a nutritionist-approved badge. Choose from either the variety box, light box or protein box subscription boxes and you will get a free Graze box with your first and fifth deliveries. If you want to change the type of boxes you receive, you can do so once you have created an account, while you should keep an eye out for Graze offers. The beauty of Graze is its simplicity. Just tell them what you enjoy from a food menu which features more than 100 popular treats and they will hand-pick a box for you containing four snacks, which will then be delivered to your door, either at home or work. What's more, they offer free shipping with every one of their snack boxes. When it comes to choosing your snacks, you will find everything from nuts and dried fruit to punnets featuring chocolate and olives. Graze pick your snacks based on how you rate the foods available - which takes a matter of minutes - to ensure the box is right for you, while when it comes to ordering, you will just have to choose your box type - a variety box, light box or protein box - and enter your delivery and payment details. You can cancel your subscription at any time, though due to the fact the boxes are prepared in advance, you will need to do so before the cut-off time for your next delivery. You will pay per box with your credit or debit card and payment will be taken a few days before you are due to receive it as they will need time to prepare it. You can choose to send boxes to different people and addresses if a friend wants to trial them, while because their original boxes are letterbox sized, you will not need to be in to receive them. However, if you are wanting to share with others, their sharing boxes are bigger, which means that if you are not in, you will be left a card with details of how you can collect it. 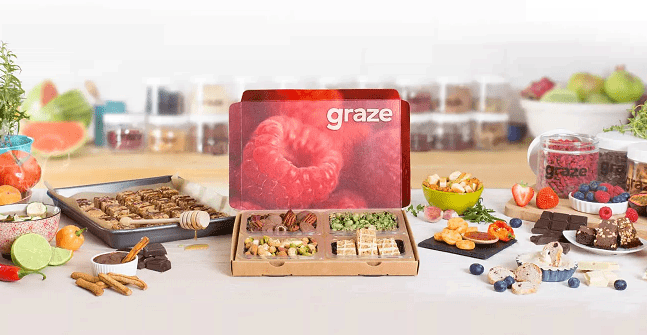 Order your first box now and cut the cost with our Graze discount code and cashback deals. Graze believe that making a healthy and nutritional choice should not mean that you have to compromise. As a result, they ensure their delicious Graze box products meet three promises. Whether you choose fruit, nuts, cookies, carrot crisps, popcorn, Chinese style honey sesame, seeds, bakery products, protein bites, energy bars or dips, you can be sure there will be no artificial flavours, colours or preservatives. They believe that the best snacks are made using the fresh ingredients nature has to offer. You can also be sure that, whatever the packaging, each of your personal snacks will represent a perfectly balanced portion, as Graze believe portion control is important for a healthy lifestyle. They have established the best portion size for each snack, as well as the ideal ratio of ingredients, which are carefully weighed to produce the right balance. Graze also have a fully qualified nutritional therapist and they make sure that the nutrition of each of their healthy snacks is clearly marked, while you will also find recipes and tips for making better choices if you take a look at their blog. Buy using our Graze box discount you will be sent cuisine which offers 'nature delivered', natural, wholesome and nutritious ingredients. Each of their snacks is healthy and tasty, with the benefits highlighted by a variety of symbols. You will discover products ideal for the whole family which will count as one of your five a day, others which contain 150 or fewer calories and Health Stars, which are the healthiest snacks in their range. Graze also offer items which are a great source of vitamins and minerals, fibre and protein, making them great snacks you can give the kids as a weekly or daily treat. Thanks to their extensive menu, you will be able to switch between Graze snacks and enjoy a variety of benefits, while whatever you choose, be it honeycomb crunch sharing bags or fruity flapjacks, you can be sure that your portion will be perfectly balanced to ensure you get the right amount of nutrition. Give someone else a tasty treat in the form of a Graze gift voucher, which will enable them to buy exciting and healthy snacks. You can either print out the gift voucher yourself and present it to the recipient however you like, or it can be sent straight to them via email. The gift vouchers can be redeemed against Graze's subscription boxes, which normally cost £3.99 each. There are a variety of vouchers to choose from, which will cover the cost of three, five, 10, 15, 30 or 50 boxes, meaning the cost of them ranges from £11.97 to £199.50. As soon as the recipient receives their vouchers, they can visit graze.com, choose their free Graze box or boxes and tell them where they would like them to be sent. 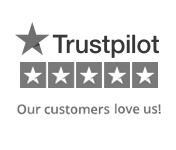 The gift vouchers also offer great flexibility as, if they change their mind, the recipient can make alterations to their box deliveries at any time. The gift vouchers are valid for 12 months from the date of purchase and the Graze boxes included in the gift voucher can be scheduled for delivery up to a year from activation. Vouchers cannot be used in conjunction with any other offer or promotion, nor can they be returned or exchanged. Get a tasty treat in more ways than one with these great cashback offers. When graze began no one was making truly exciting healthy snacks. So they got creative in the kitchen, experimenting with wholesome ingredients, playing with everyone's favourite flavours, and using a bit of imagination to create healthier snacks worth getting excited about. Now there are over 100 graze snacks, each one approved by the graze nutritionist and delivered to snackers all over the country. Enjoy flapjacks, protein granolas, savoury mixes, portioned sweet treats and more in your graze box, handpacked for you based on your taste preferences. All you have to do is choose a box type and enter your delivery and payment details, and you can start looking forward to healthier exciting snacks!